The dawning of an RPG series. 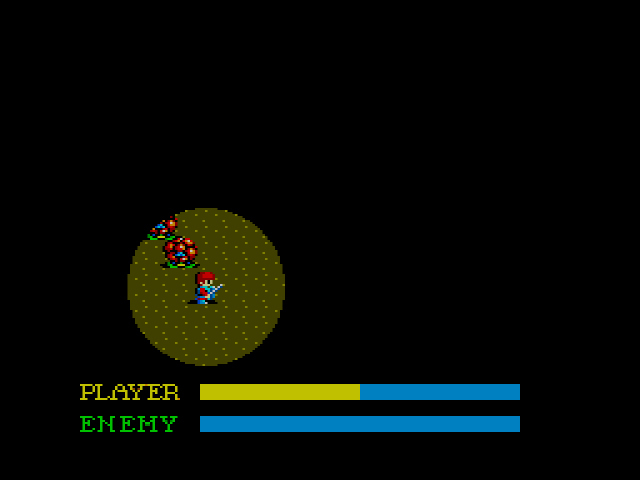 1987 and 1988 were watershed years for RPGs. If you can believe it, the first iterations of Dragon Quest, Final Fantasy, Phantasy Star, and Ys were all released within these two years. Surprisingly, all series are still seeing new releases to this day. That kind of longevity is unheard of. Outside of Mario and Zelda, I can’t think of two other game series from this time period that continue to see regular new releases (if able, pour one out for Castlevania, Mega Man, and Contra). And if you don’t know, now ya know. Out of the aforementioned landmark RPG series’, Ys is the intimidating oddball. Falcom, the developers, seem to pride themselves on revamping and re-releasing older entries in the series, changing key story bits here and there while fine-tuning the gameplay. 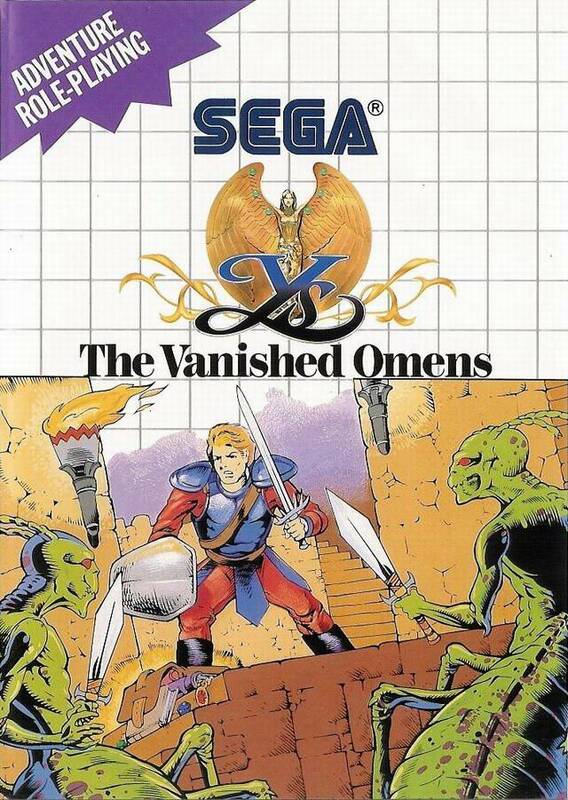 This isn’t necessarily a bad thing, but consider: Ancient Ys Vanished Omens (or Ys: The Vanished Omens for us Westerners) has been released on eighteen different computers/consoles within a twenty-year time span – from the PC-88 to the Wii. Most of those ports were Japanese-only, but still! If you’re looking to play the “definitive” version of Ys, much research is required. Wolves on a bridge? That’s a paddlin’. My personal journey began with the Master System Ys port, and brother, what a long and grindy adventure it’s been. You play as Adol Christin, a strong, handsome, silent type who has been tasked with finding knowledge of the land of Ys. To do so, he must find the six books of Ys, bone up on their contents, and use said knowledge to stop evil (and transport himself to Ys). You’ve heard this song and dance before, because Ys is from the far-off world of 1987 where RPGs don’t have long and involved stories. No matter: the meat of Ys isn’t found in the story, but in the game’s curiously eccentric combat system. “Oh man,” indeed. No, I’m not looking for a good time. I played my fair share of Ys, and I’m still unsure whether the combat system works or not. The system is… interesting, and despite my hang-ups with it, I continued to grind my face off. That counts for something, right? 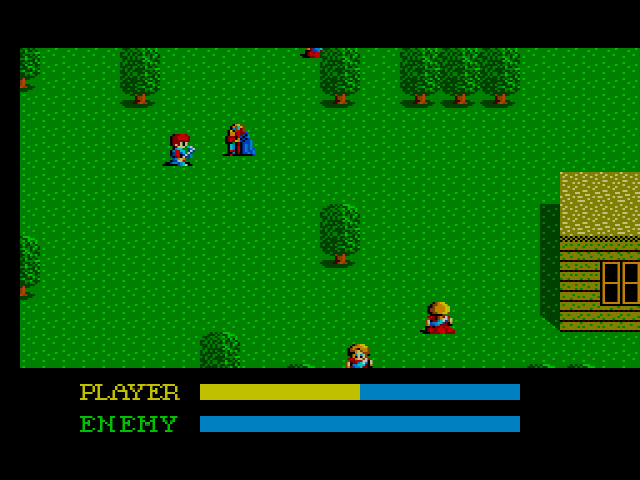 Instead of a typical turn-based RPG where you’re flung from a top-down overworld view into a separate battle screen, in Ys, you directly bum rush the enemy with your sword. No menus. No tedious scrolling through options. Just a quick real-time in-your-face rap with the sword – sort of. You can’t just slice and dice and expect to call it a battle. You have to walk sideways into the enemy, hitting them just so in order to cause any damage. Mind where you stand too. Attacking them head-on from a slightly wrong angle causes your life to drain as fast or faster than theirs. And the enemies never stop shifting directions. I wouldn’t call them ‘smart,’ per say, but they know how you intend to kill them and they won’t stand for it. Taking down an enemy that won’t stop moving is a great feeling, particularly when you don’t lose any health. 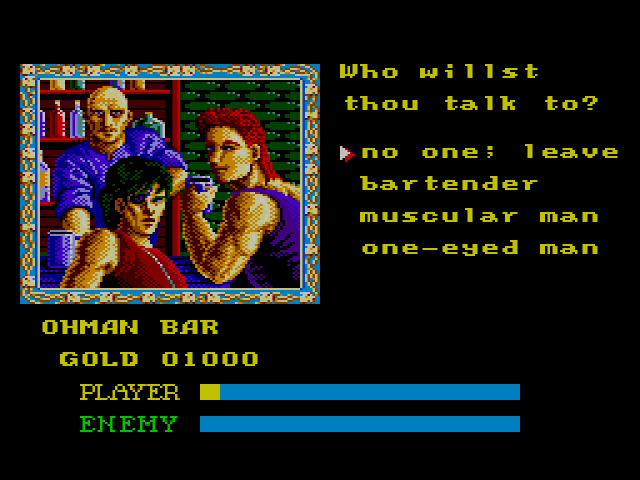 But woe be to the player who thinks Adol is at all a strong character, particularly in the beginning. When you face an enemy that’s a level or two above yours, one to two hits from them will kill you. Because these are real-time battles, these hits happen so quickly that you’ll be surprised by your death. The solution for this is twofold: 1) your health replenishes when you stand still, a fantastic and welcome feature; and 2) you have the ability to save anywhere at any time. The problem is, until you’re used to the combat system and/or the quickness with which you can be killed, you’ll want to be saving after every enemy skirmish. Which sounds silly, until you’ve experienced the death and frustration and more death. 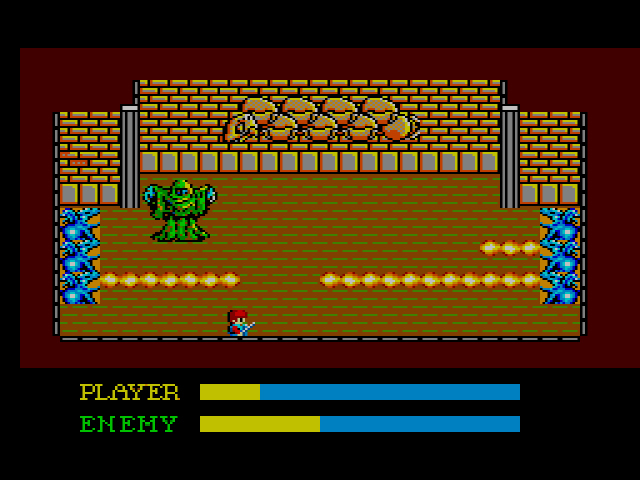 However, once your own level is above lower-level enemies, you can literally walk through them and kill them for easy experience. +1 for Adol and those that control him. I dare say I’m screwed. And if angle-driven real-time combat wasn’t enough to set your girded loins ablaze, get ready to grind like you’ve never ground before. I spent two hours fighting weak knights (who only provided 4 XP) outside the first temple, just so I could face the first temple boss and not worry about imminent death. I probably wouldn’t have taken so much time, but enemies are surprisingly scarce. At times, I’d spend a good twenty seconds walking around, looking for another 4 XP-dropping knight to kill. These mutated McNuggets are surprisingly hard to kill, but the taste can’t be beat. Ys combat system is like raising a child. Every time you think you’ve figured it out, the system throws you a curveball. You want to understand the system, in spite of the pain and frustration it causes you. You keep persevering with it through victories and failures. There is no reason for you to do this, yet you do it anyway. This, friends, is called unreasonable love. Questionable analogy aside, Ys held my attention with its beautiful soundtrack and meticulously crafted world. Yuzo Koshiro and Meiko Ishikawa’s music give the game a depth and emotion that, frankly, it doesn’t earn. Buy one of Ys four soundtrack releases, it’s that good. Ys world is smaller than most RPG worlds. Even at the time of the game’s release, two towns, three dungeons, and a tiny overworld didn’t amount to much in terms of content. Personally, I feel the world’s smaller scale suits the story. You never have to worry about getting lost and the constant backtracking ensures a comforting familiarity with each area. As the torch grew dim, so too did Adol’s resolve to live another day. Ys is a quaint counterpoint to more epic widescreen RPGs like Phantasy Star. 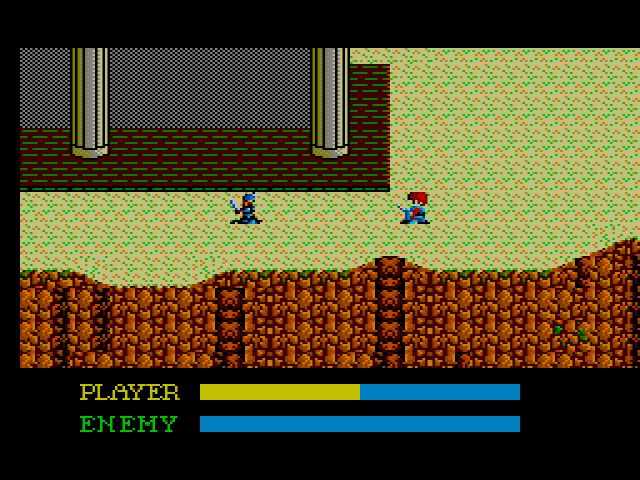 But what the former lacks in flash, it makes up for with innovative combat and an intimate world. 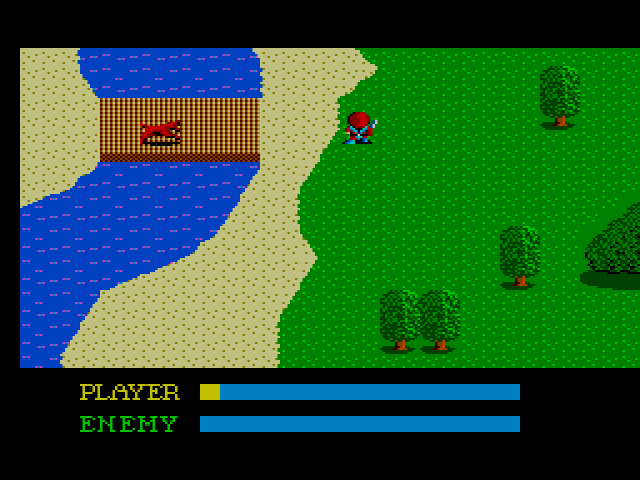 There are few RPG series as unassuming and yet relentlessly fascinating as the Ys games. 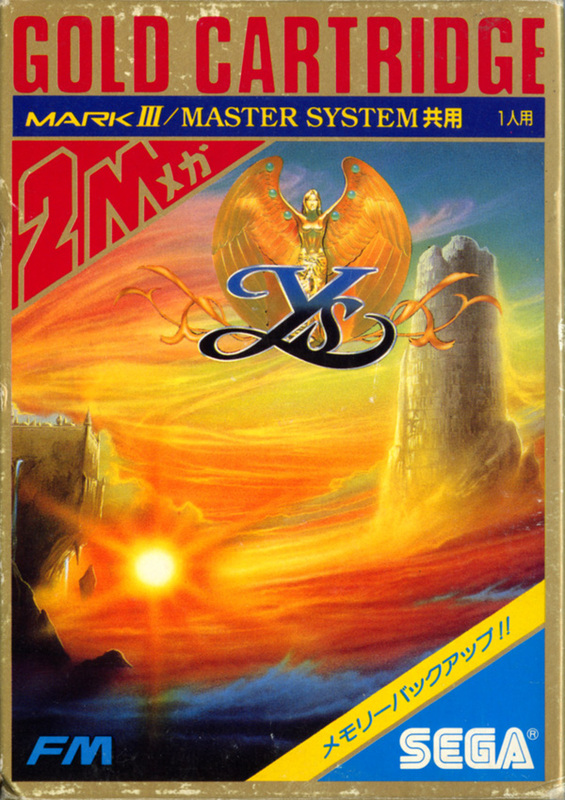 If you haven’t taken the plunge into Ys admittedly confusing depths, you could do worse than the Master System port. 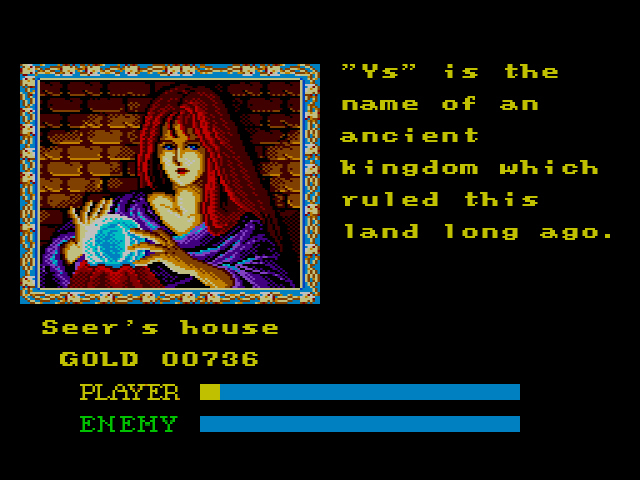 Though I was able to pick Ys up at a flea market for a mere 1 euro, I haven’t come around playing it yet. Due to my policy of sticking with a game till the end credits roll. I wasn’t able to properly comment on so many games – though all present on my shelve -you already reviewed: Zillion, Shinobi, Kenseiden, Zilion, Double Dragon, … It’s beginning to frustrate me tremendously! Being stuck in “Ocarina of TIme “and not wanting to consult a walkthrough doesn’t help either! I’d like to reiterate my point I made in regard to “Phantasy Stars” difficulty. As long as you’re able to save your progress. The grinding and backtracking (although according to your review, in this case the backtracking seems to serve it’s purpose) in these type of games might become tedious after a while, but it doesn’t necessarily make the game difficult. Having limited continues in 8bit platformes often deters me much more! Where Ys becomes difficult is when you enter an area with new enemies. If you’re not leveled up properly, they can kill you really fast. If you’re being extra cautious, as I was, these quick deaths force you to save after every enemy death. Which doesn’t mean the game is “difficult,” per say, but saving in this manner does grow wearisome. And if you don’t save like a retro grandma, as I did, then yes, Ys is quite difficult. I played this as a kid when it first came out, and had a lot of fun with it. I do remember the constant grinding but that was considered normal back then. More recently I played the PSP version that has both books I and II. The Sega version is only book I, and never realized that I was missing half the story! If anyone is new to the series I would highly recommend playing Ys I and II chronicles on the PSP. It is really well done. Dylan, maybe someday maybe you’ll review every PSP game ever made! I would definitely love to explore a Playstation system at some point. Maybe PS1 or PS2, even though they have thousands of games. 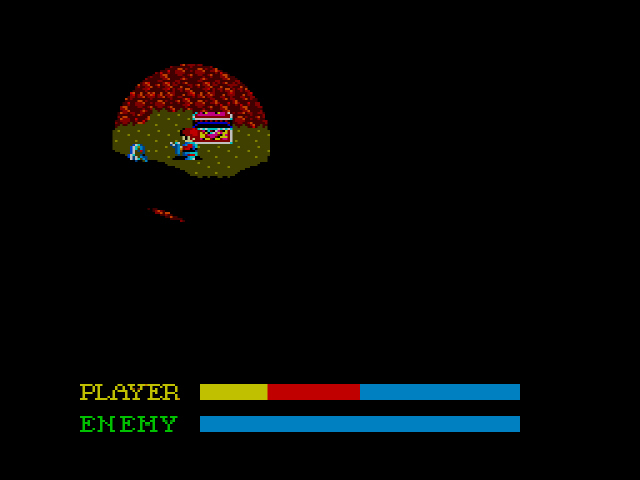 Tell you what: if I make it out from under the Sega rubble by age 40, I’ll tackle a Playstation console. I’ve always wanted to get into this series, but it seems kind of intimidating. Maybe this would be a good place to start. It’s definitely not a bad place to start, though I can’t help but feel there’s a better version out there than the Master System port. Perhaps look into the PSP or DS remakes? This was one of those series I was always aware existed, in the background somewhere (much like the Master System itself). I finally picked up I & II for the DS a couple years back and quite enjoyed them (the combat system is a bit different, though). 7 is up next for the PSP, once I’ve whittled down a few other items in the backlog, and I’ve been planning to pick up other titles when and where I can. Still a bit miffed that a friend (“friend”?) sold 3 for the SNES before ever lending it to me, back in the day! Phantasy Star I played all the way through. Golvellius and Spellcaster, about 2/3 of the way through. Miracle Warriors? More than I should have, and I still didn’t get very far. Hmm, apologies if this butchers the threading order, but I guess “REPLY” only shows up a layer or two deep? Anyhow, better late than never: I enjoyed those reviews as well! Thanks! I like to take my time with the RPGs, though playing a bunch in order dampened my enthusiasm a bit.